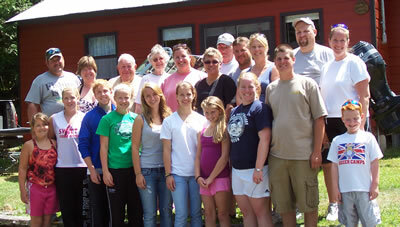 Welcome to Green Bay Heritage Cabins - A Family Orientated Camp. Join us on the shores of Bob’s Lake to spend your vacation in a quiet nature setting. For the ones that relax with a pole in hand, find Large and Small Mouth Bass, Pike, Walleye, Perch and Pan fish. There are many lakes around the area, but Bob’s Lake is where it’s at! Our lake has 469 miles of shoreline and every kind of terrain, islands, stumps, rocky bottoms, and quiet bays. All cottages are housekeeping units located close to the waters edge and have a private two piece bathroom. There is a central shower house. You cook your own meals but restaurants are not far away for a night out. All you need to bring is towels and linens. Each cottage is allocated one dock space. Sightseeing and shopping are available in Westport, Perth, Smith Falls, Kingston and Ottawa. Thank you for your interest in our Cabins - We would love to hear from you. We rent our cabins on a weekly basis from Saturday at 1 p.m. to Saturday at 9 a.m. While many of our guests return year after year, we do have some cabins available during specific weeks. Please use the online request form to let us know when you would like to come so we can attempt to meet your needs.